I have a new iPad and the just-released Apple TV. Seems like with the resolution the iPad is putting out, I should be able to get 16:9 1080p mirroring from the Apple TV to my television, yet that isn’t happening. Although the new iPad has a load more pixels that the previous model, the display’s native 4:3 aspect ratio hasn’t changed. So when you pull up the multi-tasking bar, swipe to the right until you see the iPad’s play controls, tap on the AirPlay icon, and choose your Apple TV as the destination, it projects to your Apple TV that aspect ratio. This is no different with the second-generation Apple TV. “Bummer!” you say? You must not be an iPad developer. Imagine having to rework the interface of every app to accommodate 16:9. That takes care of the interface and the vast majority of your iPad’s apps. However, there are exceptions. If you have 16:9 movies or TV shows on your iPad—and that can be either 1080p or 720p video—it will appear on the TV in all its widescreen glory, showing black bars at the top and bottom of the TV. Supported streaming video will also appear in 16:9. Some apps also support 16:9 projection—Firemint’s Real Racing 2 HD, for example. 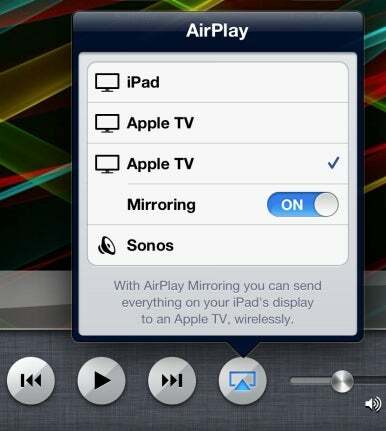 More questions about questionable Apple TV behavior? See my Troubleshooting Your Apple TV article.